This text is the second in a unified series entitled Essentials of Chinese Medicine that is an effort on the part of the publisher and authors to use concise, accurate and simple language to transmit the essential knowledge of traditional Chinese medicine. The author, a graduate of Beijing TCM University, taught for 10 years in the PRC and subsequently has taught herbology for 10 years in the U.S. The body of this book is divided into two parts. Part I consists of 47 common internal medical conditions (including addendums) presented according to the traditional medical practice of differentiation and treatment. Derived from the analysis of etiology, pathogenesis, diagnosis and differential diagnosis, patterns for the selected condition are differentiated and identified, and guidelines for treatment are provided. Part II presents 37 Western medical conditions for which TCM treatment has proven effective. 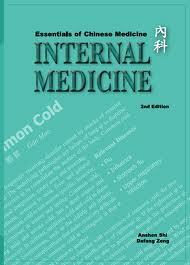 The approach in Part II integrates Western medical diagnosis and TCM differentiation of the condition. Based on the analysis of the primary symptoms, the characteristics and progressions of the patterns are elaborated, and appropriate TCM treatment measures are suggested. Current TCM studies for each condition are also introduced in Part II. It is not by omission, but to prevent dissemination of misleading information, that those Western medical conditions with few or no proven TCM therapies are excluded from Part II. Some medical conditions for which both Western medicine and TCM share common concepts are referred to the corresponding chapters in Part I for a comprehensive discussion of the TCM perspective. The contents of Part II are designed to meet the great demand for Chinese medicine from a large population suffering from Western medical diseases, and to create a new path for academia while providing an opportunity for internal medicine in clinical actualization. Revisions to the second edition are as follows. In Part I, the sequence of chapters has been changed based on the distinguishing features found in the teaching of TCM Internal Medicine, especially the sections concerning the system of zang fu diagnosis. The revisions take into consideration the teaching guidelines of TCM schools within the United States. As for the sections on diagnosis and identification of patterns, narratives and layouts have been made clearer so that mastering the content will be easier for most students. Content in application of herbal formulas in the section on treatment by patterns has also been modified, especially the information concerning formula modifications, ensuring this edition meets the demands of actual clinical practice. In Part II, the content of analysis of primary symptoms has been supplemented in order that TCM practitioners may find it more suitable for daily clinical use. Meanwhile, materials of minor importance found to be redundant have been omitted. Finally, the book's format and layout has been expanded for ease of use.